A new video of a bold parcel theft in Richmond, B.C., is revealing how easy it can be for someone to steal the stuff you buy online. Here are a few tips to keep yourself from falling victim. Jenney Lin received a note Monday afternoon saying her package from Amazon had been delivered to her Richmond, B.C., home. She also got a notification on her phone from the motion detector at her front door. On her phone, she could access the video surveillance and see the package waiting for her. But within 40 minutes, she got another notification from the motion detector. This time, it was a thief wearing a blue hat and jacket. The surveillance footage shows the suspect pull his bike up to the front door, look around, check inside the mailbox, then grab Lin's parcel, place it on his panier rack and pedal away. 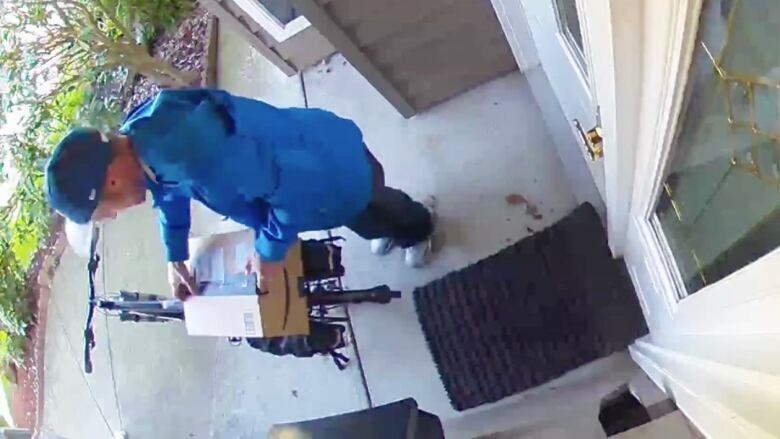 Lin said she was shocked at the theft, since it's never happened to her, and her front door is obscured from the street, so she isn't sure how the thief knew to target her house for the delivered package. "It was actually a present for my mom. There were just small items like coffee beans in it," said Lin adding that it was valued at less than $100. "It was actually her birthday present." Richmond RCMP Cpl. Dennis Hwang confirmed the report of a stolen package. He said that three officers attended the call in the 5000 block of Ladner Crescent. He said the incident does not appear to be part of a broader trend of parcel theft in the neighbourhood. Hwang suggests that if you're at work all day, and it's the kind of workplace that can receive packages, that's one way to keep parcels off your doorstep. "Perhaps send it to a storage facility or one of the approved facilities by the online shopping department. I believe some lockers are available or specialized reception sites," said Hwang. An Amazon spokesperson confirms that in Vancouver and Toronto, the company has Amazon Lockers facilities for secure deliveries. Other parcel delivery services, like UPS, also have retail locations that let customers pick up their packages at their convenience. Amazon also has a service called the "Pickup Points" deliver option, which allows customers to have their parcels sent to Canada Post retail locations, rather than their homes. As in Lin's case, many packages can be tracked online as they make their way to their destination. According to Amazon, keeping an eye on the tracking can give the customer a more accurate idea of when they should be at home to receive the delivery. If you can't receive the package at work, and you know you won't be home, consider having it delivered to a friend, family member or neighbour's house. Hwang said this may be an especially good idea if the package is of higher value. Amazon has launched a system that allows customers, with an initial setup cost, to have Amazon delivery people unlock their front door and leave the package inside your home. The company's spokesperson said in an email that while the system is in its early days, it's being well received by customers. However, it isn't available in Canada yet. An earlier version of this story did not clearly indicate the Amazon Key system is not currently available for Canadian customers.